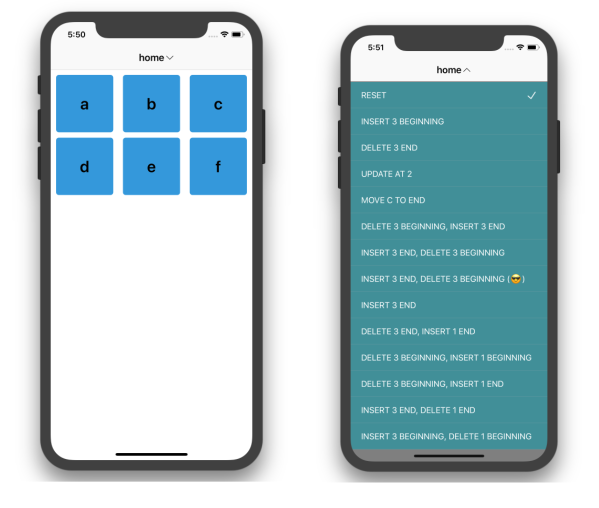 It’s hard to imagine any apps that don’t use table view or collection view, via classes like UITableView, UICollectionView in iOS, tvOS or NSTableView, NSCollectionView in macOS. Most of the time, we fetch data from the backend, cache and filter to show that data as list or grid. And later, when data has changed, we update your interface to reflect that some items have been inserted or deleted. That’s where your favorite function comes in, reloadData. This way the whole list is refreshed with completely new content. It’s fine for scenarios when you want a quick way to refresh content. But it makes the UITableView reinvalidate cell sizes again, which can reduce performance. Further if those changes should be noticeable, and you want to give users better understanding of what’s going on, then manually insert and delete of rows is preferred. If you’re doing Android, you probably know that instead of calling notifyDataSetChanged, you can use the provided DiffUtil to calculate the changes for us, so that updating RecyclerView becomes easy. Unfortunately, you don’t have that luxury in iOS, but we can learn how to do it. Let’s see UICollectionView in action. Imagine an app where users are allowed to customise their experience by moving items from one collection to another. You can take a look at the example DragAndDrop which is using the new drag and drop API in iOS 11.
reason: ‘Invalid update: invalid number of items in section 0. In my experience it happened randomly because user has different data. Although the message is very descriptive, it may take a while to figure it out. Let’s refine our knowledge of IndexPath by going through some examples. With a collection of 6 items, we perform some update operations and figure out what IndexPath should be. For a better understanding, take a look at more examples here: CollectionUpdateExample. Particularly in C, where arrays are closely tied to pointer arithmetic, this makes for a simpler implementation: the subscript refers to an offset from the starting position of an array, so the first element has an offset of zero. Below are some examples showing a simple change to the collection, and the set of IndexPath we need to figure out. Remember that we need to update items array (which is our data source in this case), before we can call any update methods on UICollectionView. No matter how we call insert or delete, performBatchUpdates always performs deletions first. So we need to call deleteItems and insertItems with the correct IndexPath if the deletions occur first. Doing these calculations by hand is quite tedious and error prone. We can build our own abstraction using some algorithms. The naive one is Wagner–Fischer algorithm which uses Dynamic Programming to tell the edit distance between two strings of characters. Edit distance means the number of steps needed to change from one string to another. String is just a collection of characters, so we can generalise this concept to make it work for any collection of items. Instead of comparing character, we require items to conform to Hashable. How can we transform form of the word “kit” to “kat”? What kinds of operations do we need to perform? You may tell “just change the letter i to a”, but this trivial example helps you understand the algorithm. Let’s get started. You can think of the algorithm as if we go from source string, to empty string, to destination string. We try to find the minimum steps to update. Going horizontally means insertions, vertically means deletions and diagonally means substitutions. Here we take value from left, which is horizontally, so we increase by 1 insertion. Continue,”t” and “k” are not the same, so we take value from left horizontally. Here you can see it kind makes sense, as to go from “k” to “kat”, we need 2 insertions, which is to insert letters “a” and “t”. Continue with the next row, and the next row until we got to the bottom right value, which gives you the edit distance. Here 1 substitution means that we need to perform 1 substitution to go from “kit” to “kat”, which is update “i” with “a”’. The algorithm shows the changes between 2 strings, but since string is just a collection of characters. We can generalise the concept to make it work for any collection of items. The implementation of DeepDiff is on GitHub. Here is how it’s used. Given an old and new array, it computes the changes needed to transform. The changes consist of: type of change (insert, delete, replace, move) and the index of the change. We iterate through the matrix, where m and n are the length of source and destination collection respectively. So we can see that the complexity of this algorithm is O(mn). Also the performance greatly depends on the size of the collection and how complex the item is. The more complex and how deep you want to perform Equatable can greatly affect your performance. If you take a look at the wiki page , there’s some hints on what we can do to improve performance. Seeing that we only operate one row at a time, it’s inefficient to store the whole matrix, instead we can just use 2 arrays to compute, and that also reduces the memory footprint. As said, we only need to keep track of 2 rows at a time to operate. Each slot in a row is a collection of changes. Here diff is a generic function that accepts any collection of Hashable items, that includes strings. And our job is just to compare items in old and new arrays, and update the slots in Row object correctly. We need to be clever on equation check, as when objects are complex, the Equatable function can take time. We know that Hashable conforms to Equatable, and that 2 same objects have the same hash value. 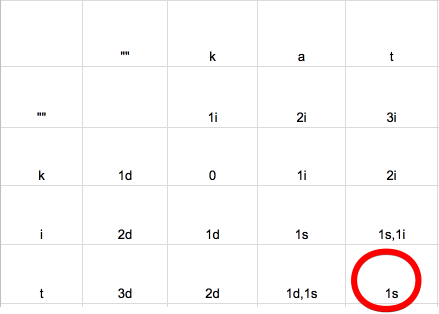 So if they don’t have same hash value, they are not equatable. The reversed is not guaranteed, but this is enough to reduce the number of calls to Equatable function. The algorithms have some other little details, but you should take a look at the code, it tells you more. By now you have notice we have just updated steps for insertions, deletions and replacement. Where’s the move? Turn out that’s it’s not difficult. A move is just a deletion following by insertion of the same item. You can take a look at the MoveReducer, it’s not very efficiently implemented, but at least it gives you some hints. With the changes array returned by DeepDiff, we can infer the required set of IndexPath to feed to UICollectionView to perform the updates. The conversion from Change to IndexPath is pretty much self explanatory. You can take a look at UICollectionView extension. There’s one thing to notice, otherwise you will get the familiar ‘NSInternalInconsistencyException’. That is to call reloadItems outside the performBatchUpdates . It is because the Replace step returned by this algorithm contains IndexPath of the state after collection are updated, but UICollectionView expects them to be before that state. Other than that it’s pretty straightforward. You can go to the example to be amazed by how fast and informative it is about the changes. When finishing this guide, you know how to do manual update to UICollectionView through manual computation of IndexPath. After struggling with exceptions, you know how such help from a library is preferred. You also know algorithm and how to implement it in pure Swift. You also know how Hashable and Equatable are used. IGListKit also implements that Heckel algorithm, but in Objective C++ and optimises it a lot. In the next article, I will write about Heckel algorithm and how to implement it in pure Swift, also how to write unit test for these diff algorithms. Stay tuned!